Is your PDF files password protected? Do you wish to remove its restrictions? Then you are at right place. 🙂 You can easily remove password and other editing restrictions with FreeMyPDF.com. With FreeMyPDF you can remove printing, copying, editing restrictions from PDF files. 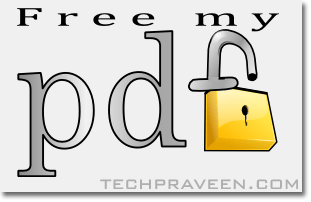 FreeMyPDF is a free service and doesn’t require any sign-ups. 🙂 This service only works for PDFs that you can open and read without any 3rd party plugins. Just upload PDF files to FreeMyPDF.com and click Do it button.PDF file restrictions will be removed and you will get a download dialog box.Save the unlocked PDF to your PC.